The first step is more of a pre-step that is all on us. With Tektonic’s remote monitoring and maintenance service, we are able to proactively take care of your computers and fix any issues before they turn into problems. Using our RMM tools, we are able to perform routine maintenances like installing security patches, updating software, checking for system errors, and more. Because we perform all of these updates on your PC from our end while you are logged off for the day, step one is non-intrusive and one less thing for you to worry about. Our remote maintenance service makes it so that when you start your workday, your computer will be updated and ready to go. With proper PC maintenance, you will have fewer breakdowns, save money, and may not even need step number two! If your PC is acting up, then don’t hesitate to call Tektonic’s Help Desk. Our friendly technicians will work with you and any of your employees to troubleshoot the problem. Most of the time PC issues can be cleared up with a brief phone call, which saves our technicians a trip to your office only to tell an employee, “Have you tried turning it off and on again?” When it comes to Help Desk phone calls, there are no stupid calls. We encourage users to call at the first sign of trouble so that problems can be quickly resolved. This is why we offer our Help Desk as an “all-you-can-eat” service, which means that we don’t bill you by the hour, freeing up everybody in your office to call at the first sign of trouble. To take care of those stubborn problems that can’t be taken care of with troubleshooting, the next step involves our technicians taking over your PC and doing what they can on their end. After spending time on the phone going over the problem during step two, our techs will now have a good idea of what the problem is. With a clear understanding of the problem, it will not take too long before a fix is found and the controls are handed back with everything in working order. The majority of PC problems can be taken care of over the phone, but sometimes the problem lies with the computer hardware and requires a more hands-on approach. To fix these hardware problems, we gear up and ship out. Not only will our visit be short because we will already have a good idea what the problem is, but we will also have less total visits thanks to steps 1-3. This approach to IT service saves us the operating expense of sending out our vans with every issue and problem. We are then able to take these savings and pass them on to you, thus making your IT service more affordable. There are many different ways to fix a PC. 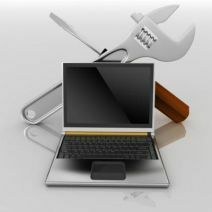 The computer repair approach of Tektonic is a conglomeration of all of these different ways. By combining proper maintenance, Help Desk support, remote support, and a technician visit, we believe we have found the most efficient workflow possible to provide great IT support for businesses on a budget. To learn more about how Tektonic’s four step IT service can save your company money and quickly resolve all of your computer problems, then give us a call at (416) 256-9928.